To say that Wokon were getting slammed is perhaps an understatement. They have two restaurants in Leeds, one near the station and the other, larger one at the bottom end of Briggate. The Briggate restaurant had fallen foul of a series of disasters that morning, which left them with leaking water and no gas. Not a good situation when all your food is cooked in a wok over the fiercest flames outside South-east Asia. The doomed restaurant was sending their trade over to the other branch, us included. We arrived at the Station branch to find the staff busy and the queues long. The cook wasn’t having fun. His colleague – order taker, ingredient prepper, server, second chef – was working faster than I’ve seen anybody work, ever, and experiencing the sharp end of his tongue, and giving some back too, to her credit. Small mistakes were happening – no chicken in the big guy’s noodles after he ordered extra – that were easy to fix but clearly frustrating. 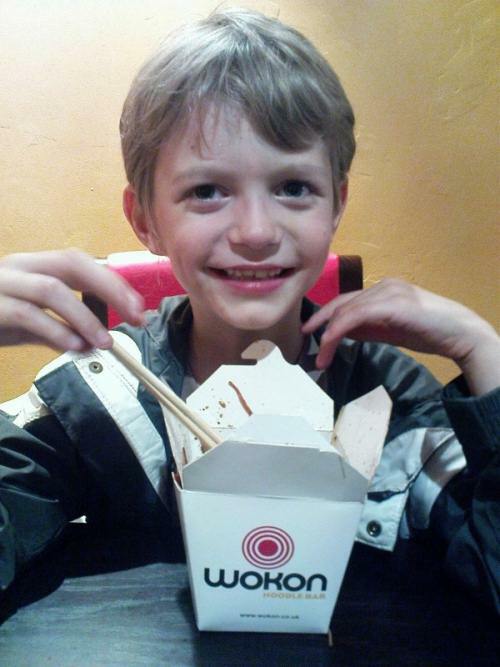 Ethan ordered a chicken satay – thick egg noodles with egg, beansprouts and tender chicken in a chow mien sauce – and I ordered a spicy chilli combo – chicken, pork and beef with noodles in a fiery sauce. The food was exceptional. Fresh, hot and perfectly cooked, the meat tender, the noodles still with some bite. For about a fiver each, this is as good as quick South-east Asian or Japanese food gets. As we ate, staff from the other restaurant started to appear with huge sacks of beansprouts and noodles. Welcome relief, supplies and a calmer kitchen. Talking to the cook later, after the rush had passed and he’d got his breath back, he guessed that their trade had been 60% up, which is a lot, an awful lot if you’re neither staffed nor prepped for it. He did well to keep the orders moving through. The food was excellent and we didn’t have to wait long at all. The noodles come in seemingly bottomless boxes, neatly tucked closed with a wire carrying handle. It’s perfect take away food in a perfectly designed takeaway container, and a steady stream of customers left swinging a little box of noodles on a wire handle, advertising the source of their lunch to passers by. Very clever marketing. Some of the offices in the centre of Leeds must smell incredible. 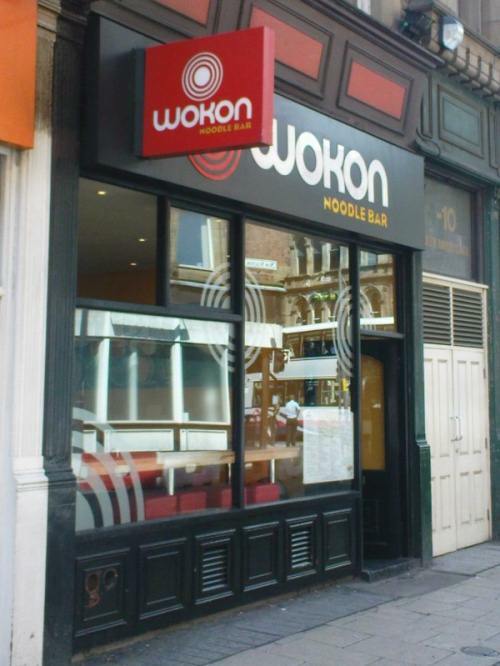 Wokon have got the formula just right. The food is good, the portions are generous, the packaging is slick and convenient and the prices are just right. One of my favs… not just for the little box but the food really is consistently exceptional. I was so impressed when on one visit I got to sit and watch as they made their own sauces.